Through ‘Share the Blessings’, our Ramadan Food and Toy Drive collected and distributed 12,241 pounds of food within the local community. We were also able to distribute around 400 Eid gifts that brought smiles to children’s faces. Serving Humanity would like to say Jazakumullahu Khair for the community’s generous contributions. Thank you for helping us make a difference in the lives of those in need. A special shout-out to all of our volunteers for helping out with the packing events in Ramadan! The sorting, weighing, making food packages, gift-wrapping toys, would not have been possible without your contribution of time and efforts. May Allah accept from all of us and enable us to continue helping others! Our Eid Toy Drive gave us the opportunity to give gifts to children of more than forty families. With hopes of bringing happiness to children for Eid, we distributed 9 bikes and more than 200 toys as part of our Eid Toy Drive. Words cannot express the joy on the children’s faces when they received their Eid gifts. The entire experience was so heartwarming! Thank you to an amazing community for helping us help others. Jazakumullahu Khairan! Our Annual Ramadan Food Project is back! Last year, we distributed 278 packages all over the community, and over 1100 food items to 7 different food banks and shelters. 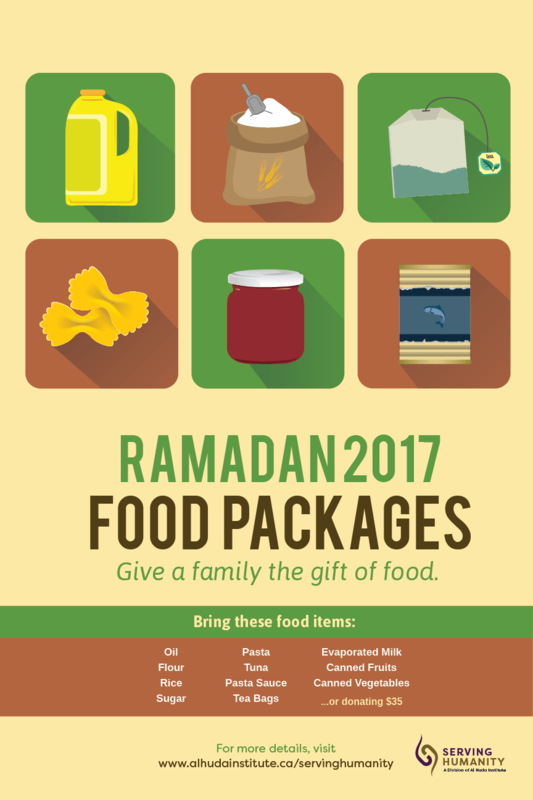 From May 12, 2017, until June 4, 2017, become a part of the Ramadan Food Packages Project. OR you can donate a monetary donation of $35. Please place the donation in the envelopes provided beside the donation boxes, and label as “Ramadan Food Package” and we’ll make the package for you. Begin the month of Ramadan by helping a family in need.